As the top National 800m runner in the 1960-70’s, Abby Hoffman was also a pioneer in administration as a member of Executive council of the IAAF. Born in 1947, the Toronto athlete initially distinguished herself in hockey – as a girl participating on a boy’s team. As a teenager she won the 800m at the 1963 Pan Am Games. She would rule the event in Canada as a member of the Toronto Olympic Club (under coach Paul Poce, 2009 inductee) for much of the next 14 years – 8 National titles and the CR from 1962-75, taking over 10 seconds from the record (2.10 – 2.00) during that period. She won medals at both CG (gold in 1966) and Pan Am’s (gold in 1963 and 1971), FISU and the Maccabiah Games. 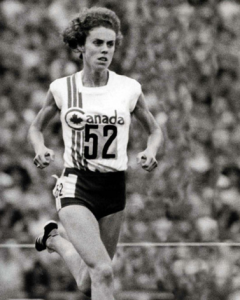 She was a two-time Olympic finalist (1968 and 1972) in the 800m establishing a Commonwealth record during the latter, and culminated her athletic career as the Flag bearer for the 1976 Montreal Olympics. A pioneer in women’s administration at this time, she was named Director General for Sport Canada (1981), appointed to the executive committee of the COC and later a member of the IAAF executive council (1995). She was named an Officer of the Order of Canada in 1982. Hoffman’s contributions on and off the track reflect the pioneering spirit that has defined her career.